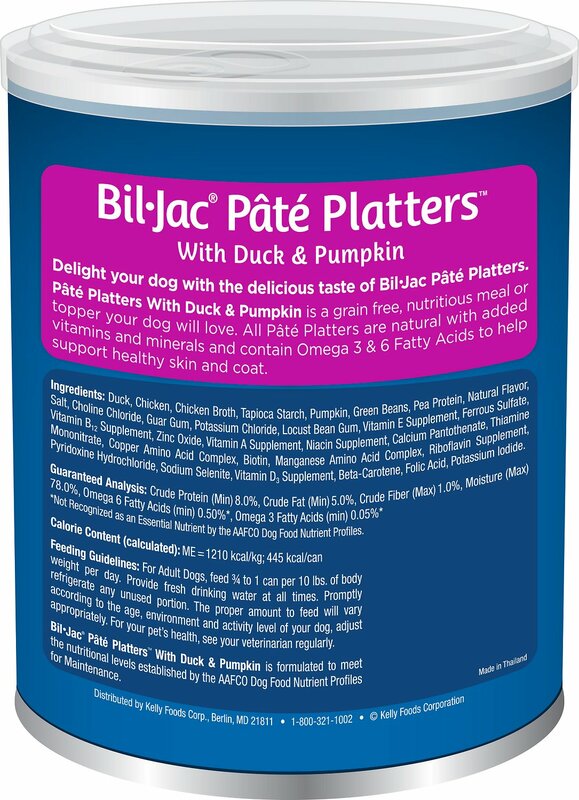 Delight your hungry pup’s palate with the delicious taste of Bil-Jac Pate Platters with Duck & Pumpkin Canned Dog Food. 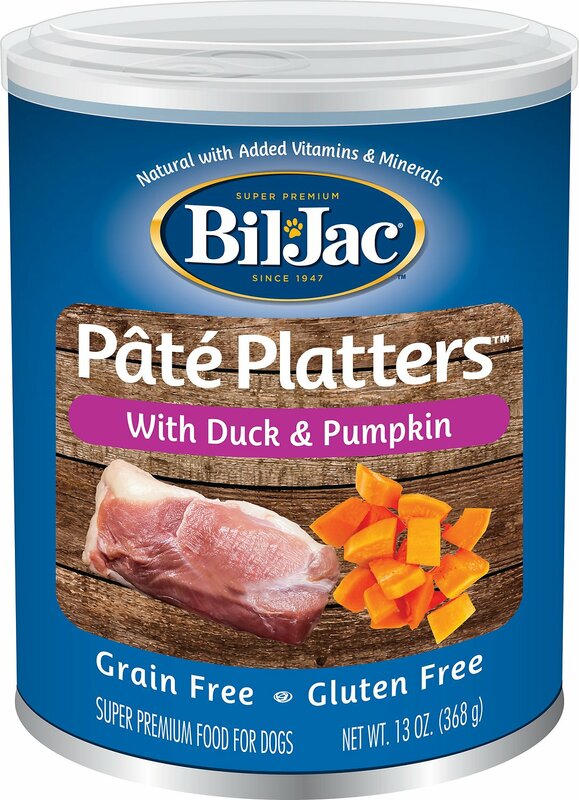 This wholesome, savory food features real duck as the first ingredient, along with chicken, pumpkin and green beans in a grain-free, gluten-free recipe that’s ideally suited for the pooch with food sensitivities or allergies. It’s fortified with essential vitamins and minerals to deliver complete and balanced nutrition, while naturally-sourced omega-3 and 6 fatty acids keep her looking as good as she feels with healthy skin and a bright, shiny coat. 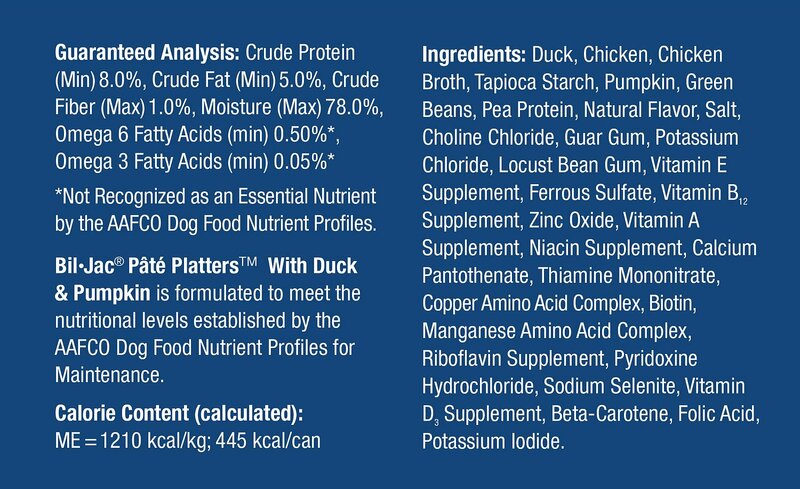 Super-premium food features real duck as the first ingredient, along with chicken, pumpkin and green beans in a palate-pleasing pate. 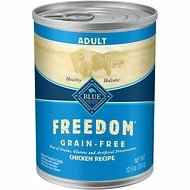 Grain-free, gluten-free recipe is ideally suited for the pup with food allergies or sensitivities. Naturally-sourced omega-3 and 6 fatty acids help nourish her skin and give her a smooth, lustrous coat. Formulated with vitamins and minerals for complete and balanced nutrition whether served as a meal or a delectable topper over dry kibble. Bil-Jac has been made with love since 1947. For Adult Dogs, feed 3/4 to 1 can per 10 lbs. of body weight per day. Provide fresh drinking water at all times. 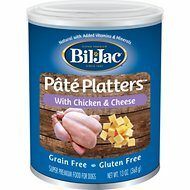 Promptly refrigerate any unused portion. The proper amount to feed will vary according to the age, environment and activity level of your dog, adjust appropriately. For your pet's health, see your veterinarian regularly. I have a 3 year old Yorkie/ShihTsu mix who had some allergy and digestive issues and was underweight when we rescued him. I tried several other brands, but he refused to eat them. I tried this and he absolutely loves it. His allergy and digestive issues improved immediately and now are gone. His coat is beautiful and he's maintaining a healthy weight now. I love the fact each can comes with a plastic storage lid, too! My boy, Ralphie, loves this food. He is a rescue and is timid about his food, but with this he really likes. He needs special foods for his skin and duck is on his list of preferred meats. I have multiple dogs and this food upset their stomachs. It didn't look very good when i opened it up as it had this fatty residue all over but he didnt seem to mind and loved it.